Improved diagnosis is driving precision in treatment. A customized, more personalized approach to medicine has demonstrated higher patient recovery rates and is driving development and approval of drug products to serve specific patient population needs. Time pressure to bring these drugs to market is driving competition within the industry. Today, more than 41% of biological drug products require lyophilization – the science of freeze-drying – and this number continues to grow with the development of more complex drugs requiring a need for stabilization to optimize shelf life. The goal is to bring parenteral products safely and quickly to market by enhancing product and process knowledge at every step and substantiating the process within a data-rich environment. Beyond the design space, real time data is important proof of a process well under control and ensures your product submission is more compelling from a regulatory perspective. By establishing an expanded design space, users can develop a more flexible approach in development and manufacturing process and it is then easier to implement continuous process improvement and maintain product integrity within the boundaries of that design space. SP Scientific’s Line of SightTM approach provides a breakthrough suite of freeze drying equipment, with scalable lyophilization technologies and process analytical technologies (PAT), designed to assist pharmaceutical developers and manufacturers achieve drug commercialization objectives. Line of Sight equipment and technologies have been integrated for pharmaceutical application to provide enhanced equipment capability, increased process and product understanding bringing together the tools to expand your design space and enable more successful scale-up of a lyophilization process, from formulation to full commercial production. This ensures superior product quality and uniformity and creates a data-rich environment for the successful operation of all sizes of freeze-drying systems. NEW Line of Sight White Paper Available - Click here to download your personal copy. Dr Kevin Ward, Ph.D., Director of Research and Development at Biopharma Process Systems Ltd, discusses how the expansion of design space increases the probability of executing a successful lyophilization cycle. Process design begins with a robust formulation that has the most accommodating physical properties before, during and after the freeze-drying process; stable formulation that can survive the stresses of freeze-drying process and also gives highly reproducible products meeting safety and efficacy standards for their intended use and meeting product quality attributes. For example, fast and reliable reconstitution for patient use. State of the art product characterization tools are crucial in maximizing API activity and minimizing the chance of contamination while ensuring long term stability of the product and conjugates. Freeze-drying microscopy is one of the leading instrumentation approaches allowing formulation scientists or chemists to both fully understand the behavior, and optimize the formulation before moving into any cycle development. A robust formulation means scale-up is simplified and a quality product easier to achieve. Once users have the formulation that gives a product meeting prescribed quality attributes, the job of designing the process that will reliably make that product begins, firstly with the LyoCapsule™ as the smallest dryer on the market that gives users data relevant to the production machines. SP Scientific’s Line of Sight suite of technologies is common across its freeze-drying platforms from the 7 vials LyoCapsule to full commercial manufacturing. Using only 7 vials enables scientists to assess viability of formulation and start developing cycles sooner when active pharmaceutical ingredient (API) is scarce; and enables users to run many more test cycles than in traditional process optimization with the smallest possible quantity of waste of that precious API. Tools such as SMART, AutoMTM, ControLyo, LyoFlux sensor and identical software platform are available to enable users to facilitate a quick start on the project. These tools generate the data needed during this small scale cycle development before users make larger batches to start laboratory stability batches and analytical method validation work. The illustration below demonstrates a cycle that was developed in a LyoCapsule freeze dryer. At some point during the development through the clinical phases, successful Phase I and II of this product will ensure larger batches to accommodate larger patient population. Additional capacity will be needed in this case or utilize existing equipment which could be oversize for the batch users are targeting. Whether you are addressing capacity, tackling fast track projects or requiring dedicated equipment for potent chemicals such as cytotoxic, genotoxic, antibody drug conjugate (ADC) as examples, SP Scientific has the solution and meets these needs with a new line of products, LyoConstellation™ freeze-dryers. Additionally, both LyoConstellation and LyoCapsule freeze dryers utilize the same renowned LyoSTM control software, providing a seamless transition between systems. Stability testing is a lengthy process but if you are to prove the stability of your product in the distribution chain to the point of care, it is critical that it is done well and the key is getting relevant data early on in the process optimization of your product and therefore minimizing the time to market. SP Scientific’s Line of Sight allows you to work on production quality material with the same monitoring technology as the final commercialization scale at the earliest possible stage. 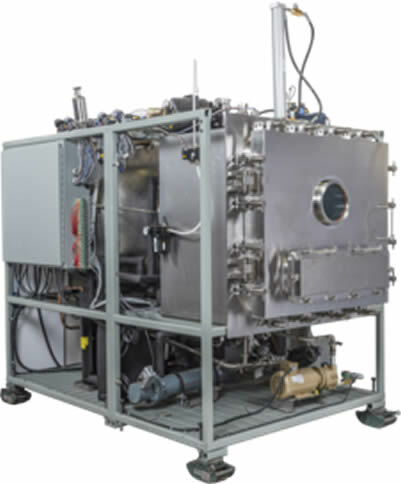 LyoConstellation™ S10 is a new fully equipped production freeze dryer with full CIP and SIP capability that can prepare your material for both stability testing and the first of the clinical trial material simultaneously, to enable stability testing to run concurrent to your process optimization. The notion of working quickly on developing freeze dried products in early stages of clinical phase testing could benefits users who can, at a later date with more clinical data for safety and efficacy of the product and viability at late stage clinical testing, consider other presentation or remain as freeze dried products going into full commercial manufacturing. The focus should also be on the “most like” production equipment during the development effort. Another aspect is to create development materials in a “clean environment” [low particulate level – to understand how degree of super-cooling and freezing behavior could impact temperature profile, product resistance during scale up] and this is a more compelling reason to consider a LyoConstellation S10 in as part of a development strategy within the laboratory. 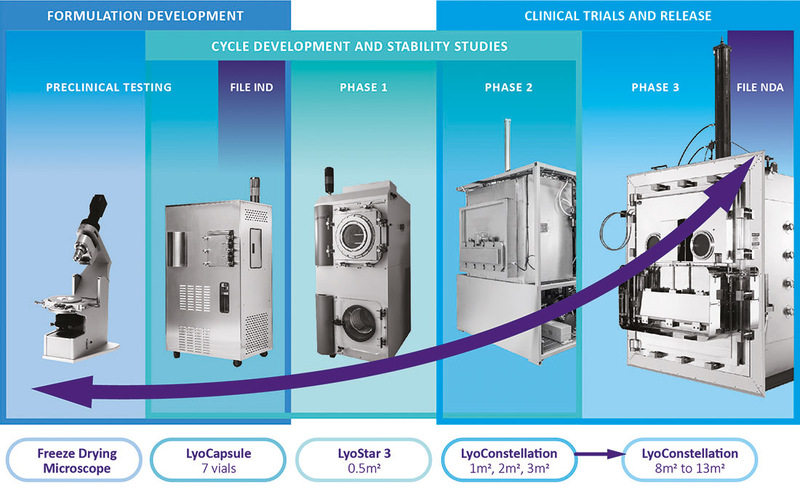 LyoConstellation™ S80, S100 and S130 development and pilot freeze-drying systems provide the entry point to making both late stage clinical materials and validation batches needed for full commercial manufacturing and launch. With 8m2, 10m2 and 13m2 shelf surface areas, LyoConstellation has the same suite of technologies used to create your cycle. Thus allowing direct comparison of data from the small scale batches that users have developed giving the exact parameters needed for the most robust and efficient cycle. In the shortest time possible you can generate the real time data that expands understanding of your equipment and process design space so when process anomalies are encountered during day to day operation, there is back-up to prove batch integrity. As users move through different stages of product development into clinical trials and eventual commercialization, data gathered during all development stages can assure comprehensive process and product understanding ensuring quicker time to market and ease of technical transfer. At different stages of the product maturity, different teams will be working on the different aspect of the process. These teams such as Product Development, Technical Transfer, Engineering, Operations and Quality Assurance can benefit from the technology and ease of understanding of the critical data required. Each of these teams will bring different knowledge skills and level of understanding. However, the technology and data across the different scales can bridge the gap between them. This is where process knowledge and transfer from one team to another can dictate the success and continuity at each of the stages. What SP Scientific offers beyond “Expansion of Design Space” and a QbD approach is consistent data from all stages of development to full commercialization of customers’ products. Data that is collected as part of the Line of Sight provides assurance those products are trending and behaving to what scientists observe in early stage of development remains comparable through the different scale. As stated before, differences in product temperature profile means product stability will be different and could potentially impact long term stability putting risks to quick transfer and manufacturing. All LyoConstellation systems operate with the LyoS™ control software, providing a seamless transition between systems. Bringing together a broad range of standardized freeze-dryers, compatible with scalable technologies and PAT tools, enables accurate comparison between all scales of manufacturing from sub-vial scale chemistry studies through to commercial production. These standardized freeze-dryers can be equipped with the same technologies and the SP Scientific LyoS™ 2.0 Control System software to drive the cycle. Using the same reporting format allows easier scale up and gains a better and faster understanding of your product and freeze-drying environment. SP Scientific provides the tools and techniques to streamline product development through commercialization of products in a more efficient and data driven approach. Your investment and valuable products are as essential as the patients’ safety benefiting from the treatment. Dr Alexandra Braun, Ph.D., Leading Scientist at GILYOS GmbH, discusses the key benefits of lyophilization cycle development with just 7 vials of product. SP Scientific is leading the way in the development and manufacture of complete aseptic vial fill-finish lines offering the broadest lyophilization range available today covering cycle development, stability, pilot and clinical batch production, to full aseptic manufacturing and commercial production batches. All SP Scientific freeze dryers can be integrated with our aseptic filling lines as a turnkey project or other aseptic equipment manufacturers as a collaborative project to bring your product to the market quicker and realize your investment in a more systematic manner. Our experienced team will help you configure a system to best meet your Line of Sight technical and budgetary needs to enable expansion of the design space in cycle development and scale up/scale down. Importantly, innovative technologies can be embedded in all SP freeze dryers allowing accurate comparison between all scales of manufacturing, from seven vials to thousands, whether the project is to replace your existing equipment for up to date technology or for new line integration to expand your capacity. Additionally, SP Scientific offer a new LyoModelling Calculator tool to help model your freeze-drying cycle which you can access by clicking on the button below. Following the Tech Conference at Interphex, the presentation is now available to download on the SP Scientific Line of SightTM approach which provides a breakthrough suite of freeze drying equipment, with scalable lyophilization technologies and process analytical technologies (PAT). This interview with Bill Kessler, Principal Research Scientist & Manager, Physical Sciences Inc, discusses the value of LyoFlux® as an innovative line-of-sight tunable diode laser absorption spectroscopy (TDLAS) based device for continuous monitoring of laboratory, pilot and production scale lyophilization cycles enabling users to better understand instantaneous changes in water vapor mass flow, and thus the sublimation rate for a given product during freeze-drying. This article discusses the retrofitting of ControLyo® Nucleation Technology to benefit all stages of development, enabling more consistent cycles to be recreated. Importantly this improves homogeneity, reduces cycle times, improves cake consistency and increases product yield. Download to read the full article. Article first published in the December 2018 issue of the Spinco Biotech CuttingEdge journal. Please request any specific Line of Sight information required or if you would like a Product Specialist to contact you. SP Scientific’s mission is to give you control in your process with scalable technologies, from the laboratory to full production. SP brings together some of the most noted brands focused in research and development – including VirTis, FTS Systems, Hull, Genevac, Hotpack and PennTech – covering freeze drying/lyophilization, evaporation , concentration, temperature control, thermal management, glassware washers and controlled environments. For sterile production, SP also provides world class fill-finish including vial washing and tray loading machines.